As a photographer, there is a lot of hustle and bustle especially on wedding days. But the other 90% of the time I’m sitting behind a computer screen. For years I gave myself permission to let myself go. I am a mom of four, a wife, a business owner, you get it. It’s all a bit overwhelming at times. But just a little over a year and a half ago, I met a friend of mine who through sharing her own journey, I then began mine. Tone It Up introduced me to a different mindset. It was a great place to start and the community is like no other. Fast forward 6 months and Orange Theory Fitness came to town. I remember thinking, “oh I’ll just go for two weeks and then quit before I get charged.” Yeah, if I only knew it was the beginning to the next journey I was about to travel on. 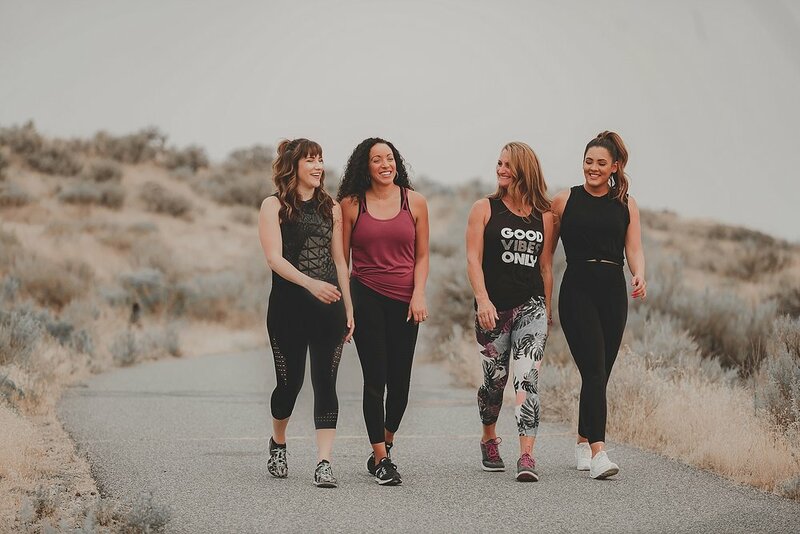 It’s not your typical workout or “gym.” And just like Tone It Up, It’s foundation is built on community over competition and you can’t help but feed off the energy of everyone else around you. Since then I have learned I could push myself far beyond my own limits. The coaches and members are truly a gold mine. I’ve made it through two challenges and lost 24 lbs. in one year (after having lost 20 through Tone It Up. These ladies started with me one year ago when the studio first opened and I absolutely love sharing the success of others, so here are a couple of their stories. Before Orange Theory, I was bouncing from training gym to training gym, trying to find what was suitable for me. I never could really find what exercise worked for my body until I found Orange Theory. As I was going to these other gyms, I never could quite get my diet on point. I thought eating less meant that I would lose weight and I was really wrong. My muscle started deteriorating and I was feeling so weak. Upon finding Orange Theory, I realized I needed to make a huge change in my diet . in order to see results. I realized that carbs are okay and having a cheat meal every once in a while is okay. I stopped depriving my body of protein and carbs and starting using a meal prep service. Throughout the past year of Orange Theory, I have noticed drastic changes in my body. I’ve dropped a slightly significant amount of weight and kept it off, all while feeling stronger and maintaining my lean muscle. I feel healthier and stronger than I have ever felt. in order to see results. I realized that carbs are okay and having a cheat meal every once in a while is okay. I stopped depriving my body of protein and carbs and starting using a meal prep service. Throughout the past year of Orange Theory, I have noticed drastic changes in my body. I’ve dropped a slightly significant amount of weight and kept it off, all while feeling stronger and maintaining my lean muscle. I feel healthier and stronger than I have ever felt. I have always been a athlete. In April of 2012 we relocated to Tricities from Spokane. In Spokane I had my group of training friends I worked out with daily. We trained for endurance races together and kept each other in check. I was afraid I wouldn’t find new friends to train with. I joined Gold's gym and trained there everyday and found an amazing running partner. But I was not as diligent as I had been in years past. I was also pretty depressed leaving the place my kids knew most and the friends that became family! Each year I gained weight, slowly it crept to a number I couldn’t fathom. After 5 yrs I was up 45 lbs. I started CrossFit and incorporated running into my daily workouts but was still not losing. I constantly changed up my eating habits but nothing was working. When OTF announced their opening in late August I joined immediately. I joined every weight loss challenge. I lost roughly 13 lbs from September to January. After speaking in depth with Terra I decided to jump on the Keto diet. January 1, 2018. It was pretty slow go for the 1st 3 months, learning and adjusting. But as soon as I found my formula, I started to lose quickly. I’m happy to say that I am down 49lbs and feel stronger than I have felt in years!